I put this project together for Simply Create and now I’m sharing it here on my blog. 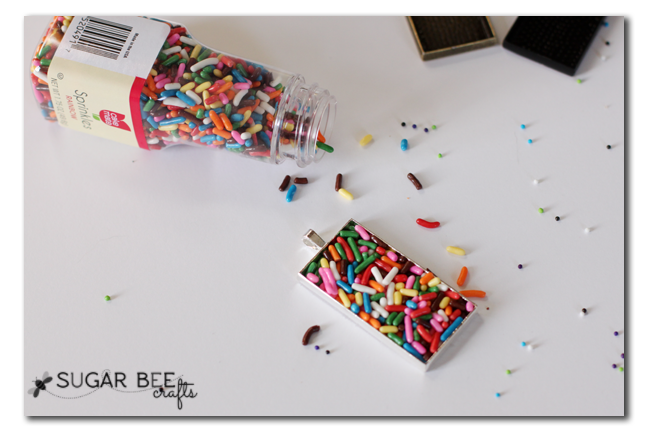 Everyone loves sprinkles! 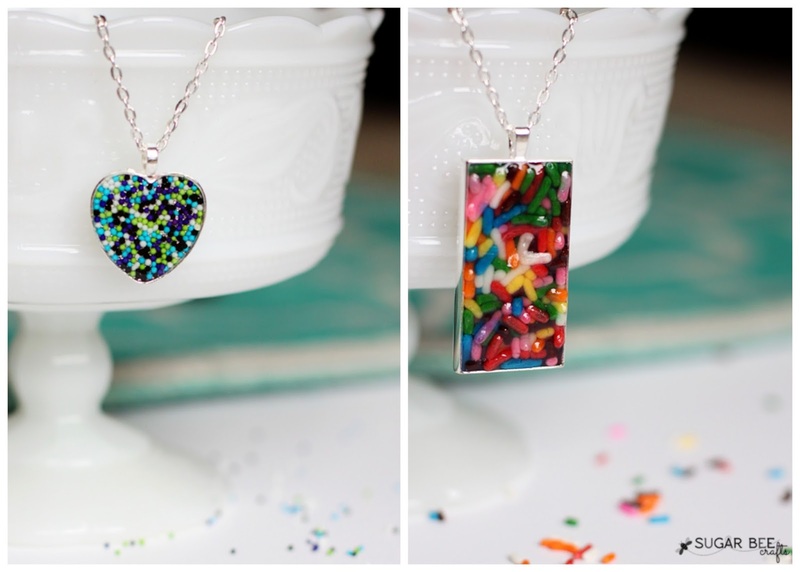 These pendants are a fun new way to showcase sprinkles. 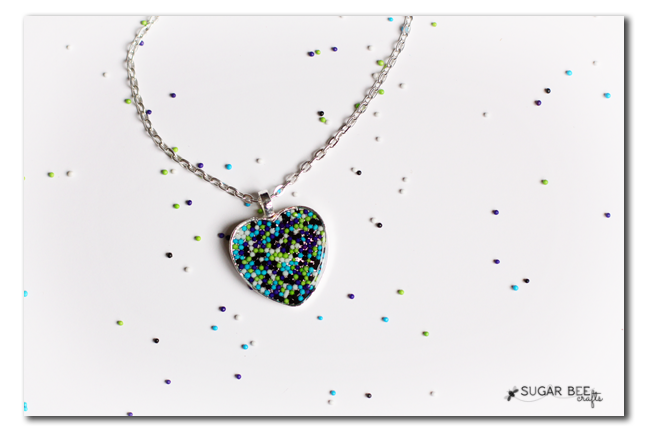 An easy craft (once you know what to use) with a variety of sprinkle options allowing you to customize it and make it all “YOU”! 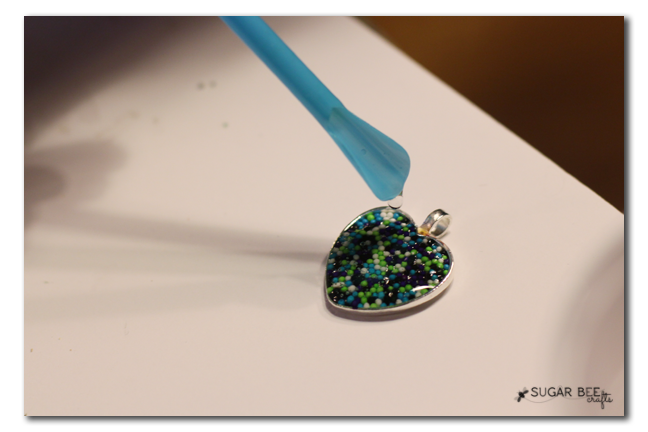 First pour a single layer of sprinkles into your pendant tray, if you would like a smooth pendant surface. 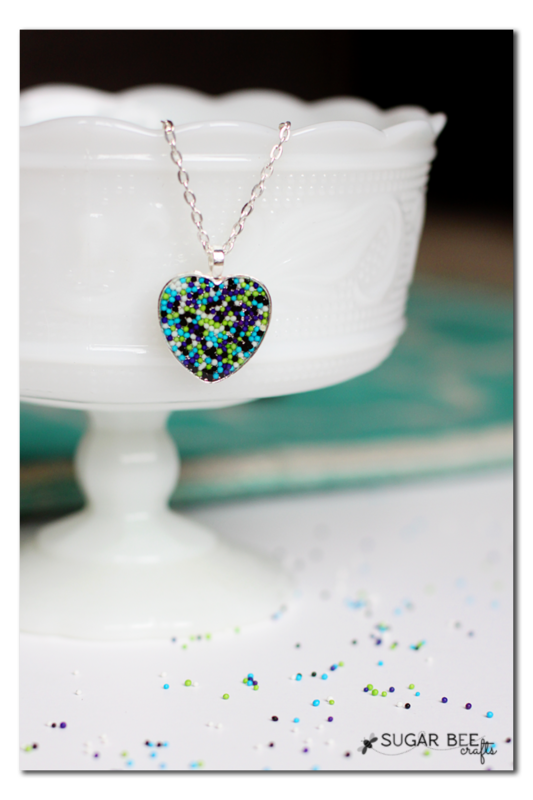 If you want added dimension and depth to your pendant, you can try filling the tray with layers of sprinkles. Now, THE SECRET: After various experiments, I found that some sprinkles dissolve with water-based sealant. That’s what makes them cloudy and melty-looking. If you are using Rainbow Sprinkles (the stick-looking ones), you are safe to use a water-based sealant. 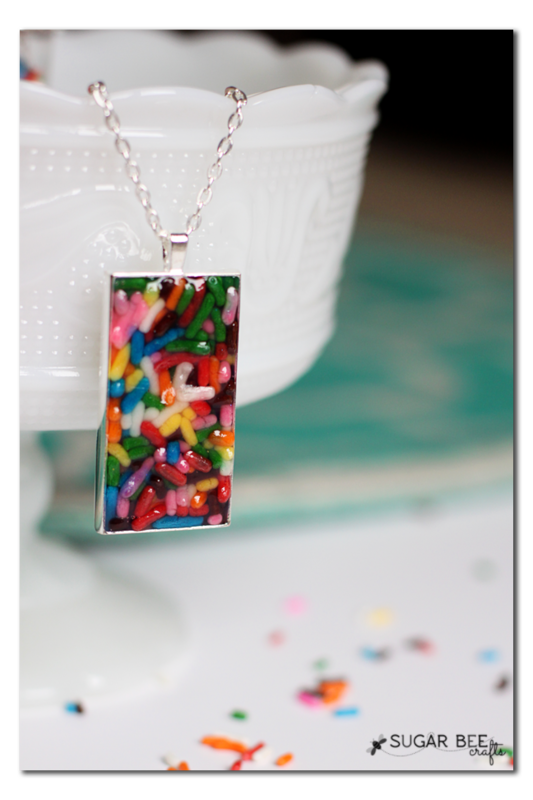 Cover the sprinkles in the tray with Dimensional Mod Podge. 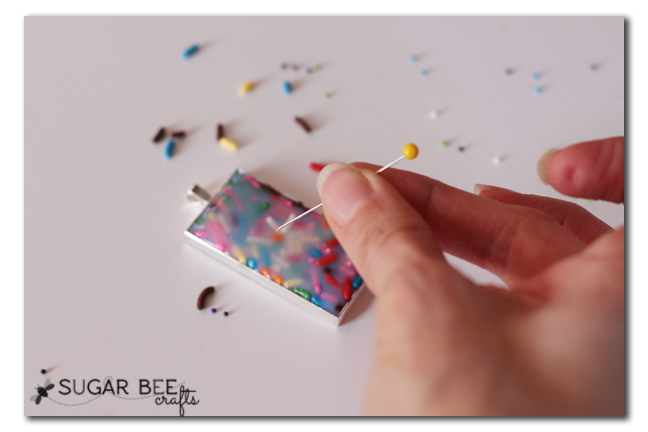 Air bubbles may form on the surface – gently release them with a pin. Let dry overnight. the air bubbles. Let dry overnight. 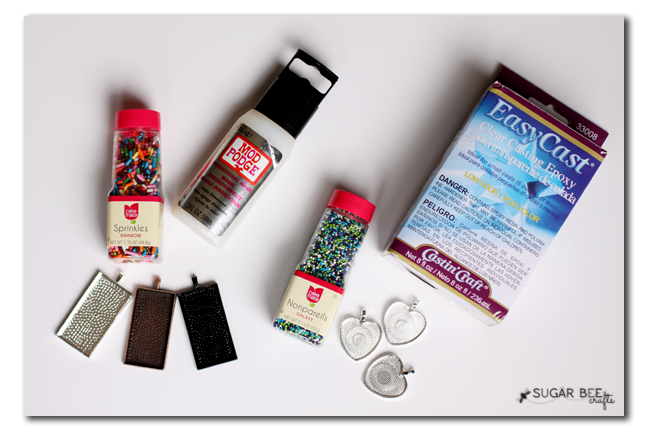 Once you know what supplies to use for which types of sprinkles, you are good to go! it’s super fun – – thanks! Love your tutorial and will share with our Facebook page! Hi Mandy, I love this post! It would be great for my afterschool class. Can you just tell me where you got the pendant holders? Are they from good ol’ Michaels? turned out adorable! tell me…how are you getting your pictures side by side??? Love this! 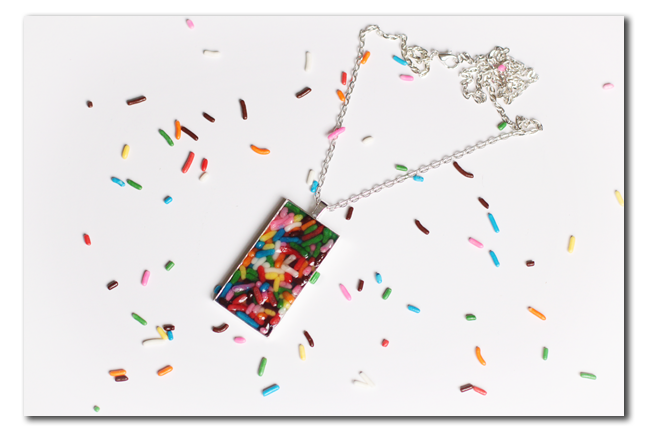 Would it be ok to use epoxy resin for the rainbow (stick) sprinkles too? I’m using it for another project so I’d love to just keep using the same stuff. I think it should be? ?